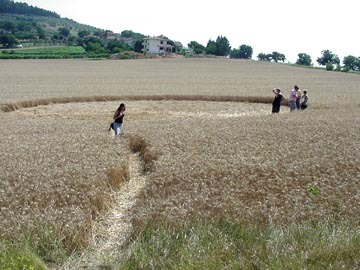 July 11, 2003 – Fornacette near Pisa (central west Italy) – Italy’s sixteenth crop formation of 2003 – an unprecedented number – was reported on June 26 in Fornacette near Pisa in central western Italy. It is a dumbbell pattern set down in the middle of a thick wheat field that had no tramlines, as English fields do. The pattern was one large circle and one smaller circle connected by a corridor. This is a pattern that was common in England in the early 1990s and has also been seen several times in Canada and other European countries. The largest circle was 15 meters (about 49 feet) in diameter and the smaller measured 6 (about 19 feet) meters. The central corridor measured 4 meters (about 13 feet) in length. So far, there have been no reports of any unusual lights or sound, but Adriano Forgione, Editor of Hera Magazine, will investigate further. 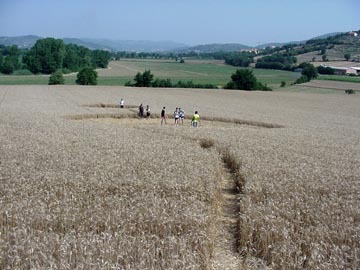 Dumbbell pattern, Italy’s sixteenth crop formation, in solid wheat field without tramlines, discovered on June 26, 2003 in Fornacette near Pisa in central western Italy. Photographs © 2003 by Adriano Forgione.